of the original Moog modular synthesizers. It contains two complete modular functions: a voltage-controlled lowpass filter and an envelope follower. It can be used with any instrument-level to line level-signal. A lowpass filter removes high frequencies from a tone. It makes the tone sound more mellow or muted. The lower the Cutoff, the more muted the tone sounds. Imagine a window shade. As it is pulled down, it cuts out the higher light, then the light from the middle of the window, then finally all the light. The MF-101 Lowpass Filter does the same sort of thing to the sound spectrum with it's Cutoff Control. As you turn up the Resonance control, the overtones near the cutoff frequency are boosted. 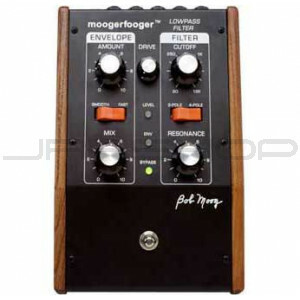 Resonance gives the moogerfooger filter the same classic Moog filter sound as the Minimoog; and Moog modular synthesizers. 110 V Power supply is included. POWER REQUIREMENTS: 105-125 volt, 5W.